Our family really enjoys kombucha and, continuous brew kombucha is even better! Why? It is so much easier! I am all for making my life easier! Our family really enjoys kombucha and, continuous brew kombucha is even better! I keep 8+ gallons of kombucha going on a brew cycle at a time! Once the fermentation is complete, we keg it, put it on tap and have fresh fizzy kombucha available all the time! To refresh your memory from my past post: Kombucha is a naturally carbonated tea that starts with a Kombucha scoby (also called a starter or mushroom) which looks like a flat grayish disk. Since the scoby does grow and multiply, if you know of someone who already makes Kombucha, they may share with you. Kombucha is so good for you! It is a delicious drink made from sweet tea and is slightly carbonated! Being full of probiotics, B vitamins and enzymes, it also tastes great. It’s all the little cultures inside, giving us health and making our bodies feel good. Like most things, making it at home costs pennies if you have a proper system. Compare this to a bottle you can buy in the store, where a bottle goes for $3 – $4! It’s amazing how much people jack up the prices for simple, good food. But how is kombucha made? It all starts with a scoby, a fermented little disc that kickstarts the whole process at the beginning. This is where all the goodness your body wants comes in. Often people find their scoby (and other kombucha-brewing friends) through local kombucha communities. You can purchase your own first scoby from my affiliate partner here. But anyway, back to kombucha. I like kombucha even better since I started making continuous brew kombucha. Why? 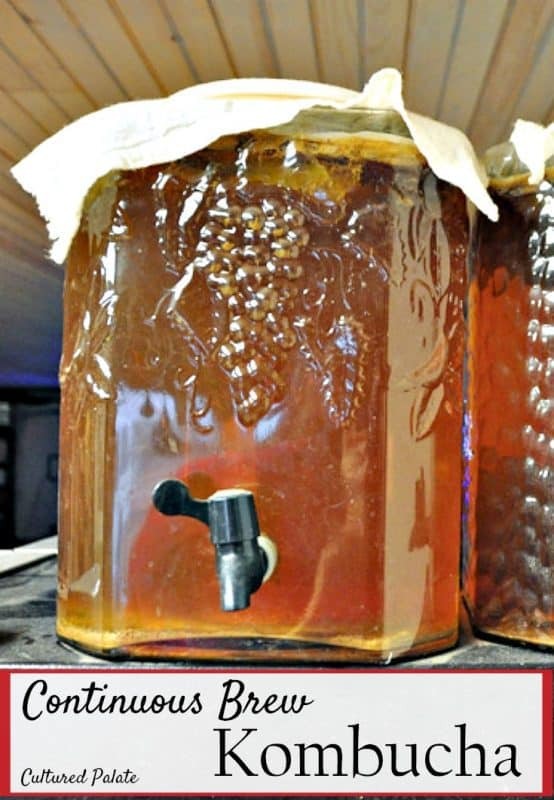 It is so much easier and makes better quality kombucha! I’m glad you asked, imaginary person. Cleaning of the entire at-home kombucha system is done only when the spigot is plugged. The tiny ecosystem established by the brewing process is not disturbed when starting a new batch and this gives consistently good quality kombucha. I began making kombucha a couple of years ago. I used 1-gallon glass jars whenever I wanted some. With so many people drinking kombucha in my family, the top of my refrigerator was quickly covered in jars! We would drink the kombucha straight or make special flavored versions like fruit flavored kombucha. So I was all for anything that made for less work on my part! I began to research the continuous brew kombucha method and thought it sounded like a great idea! Less maintenance is required. You simply add new sweetened tea to begin a new batch. Cleaning is required only when the spigot is clogged with yeast sediment or too much sediment is on the bottom. Increased chance of successful brewing. Since the ecosystem is not disturbed, there is little chance of contamination with mold and bacteria. A healthier scoby is maintained. The ecosystem developed during the fermentation process is not disturbed when beginning a new batch. The yeast and bacteria are allowed to ferment undisturbed. Removing small amounts at more frequent intervals – this can be removing enough kombucha for one day or for one week. Allowing the kombucha to ferment for 2 – 4 weeks (depending on the quantity and taste desired) then removing 80% of the container contents and beginning a new batch. I do the latter. While kombucha is naturally slightly fizzy, we put ours in a kegerator and have it on tap for the children to enjoy at will. Don’t worry though, if you do not keg your kombucha, simply put it in the refrigerator and enjoy! Make sure to use non-chlorinated water as chlorine will kill the scoby. The scoby needs sugar to live on – honey, rapadura or sugar substitutes will not work. 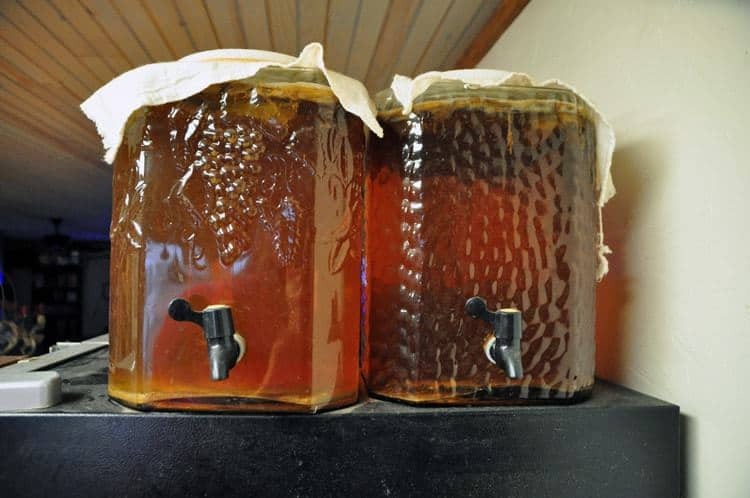 I use two 4.75 gallon glass beverage dispensers – that’s right, I have over 8 gallons of kombucha brewing at a time! I also use a tea towels secured with a rubber band as lids. When I started the continuous brewing system, I used two 3 gallon plastic tea dispensers. Not only were they plastic, the lids popped up during the fermentation process. This allowed fruit flies in, which contaminated my scobies. I will give the basic kombucha recipe which can be multiplied to fit any quantity and then show you how I do subsequent batches. 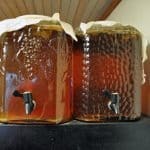 If you’ve tried this recipe for Continuous Brew Kombucha or any other recipe on Cultured Palate please take a minute to rate the recipe and leave a comment letting me know how you liked it. I love hearing from you! You can also FOLLOW ME on PINTEREST, FACEBOOK, INSTAGRAM, YouTube and TWITTER. Continuous Brew Kombucha provides the probiotic drink without as much work! Be sure all equipment is clean and rinse thoroughly so no traces of soap remain – you may also use vinegar to clean your equipment. Brew the tea by bringing water to a boil and adding the tea bags. Allow the tea to steep until cool and remove the tea bags. Add sugar to the tea and stir until dissolved. Allow to cool to room temperature. This is very important as hot tea will kill the scoby. Place the kombucha from a previous batch and the sweetened tea into the continuous brew container. Put a piece of cheesecloth over the top of the jar and secure with a rubber band – this allows air in but keeps bugs and dust out. If your kitchen is warm, the kombucha will ferment more quickly, so for the first batch, taste it after a few days. Once the taste is to your liking, follow the steps below. Prepare the tea as above, sweeten and allow to cool completely. Drain the fermented kombucha into the desired container. Since we keg ours, we use clean tubing and drain it directly into the keg. My containers are on top of the refrigerator and this allows them to be emptied without moving. The tubing used is food grade and does not come into contact with the scoby. Leave about 20% of the batch in the container to use for the next batch. You can see the layers of the scoby, as well as, the yeast sediment in the bottom. Now you are ready to refill the container with new sweetened tea to feed the scoby. Add the tea gently. I pour it right on top of the scoby which may sink or be pushed down during this process but always rises to the top again. There is no need to mix the new tea mixture with the amount left from the previous batch, the fermentation process takes care of this! Cover the top with a lid or tightly woven cloth and secure with a rubber band. Allow the fresh batch 10 days to 3 weeks to ferment. The time will depend on the batch size and the size of your scoby. Taste the kombucha every week or so until the desired taste is acquired. Prep time does not include 10 days - 3 weeks fermenting time. Kombucha has changed our life. We have not drank sodas in months, since we started making our own kombucha. I need to get some jars like that for home… so creative. How do you clean the kegs between fillings. Do you use regular brewing cleaners? Nick, we rinse the kegs out well and refill. Hope this helps! I’m so excited to try this, I never knew about the continuous brew method!